History: (What If...Magneto & Professor X Had Formed the X-Men Together? (fb)) - After a battle where newly-revealed mutants Charles Xavier and Erik Lehnsherr saved a young Gabrielle Haller from the clutches of Baron Wolfgang von Strucker, Erik prepared to kill his enemy. He was stopped by Gabrielle Haller, who explained to Erik that if he killed Strucker, he would be no different than the Nazis that Erik and Gabrielle both had encountered as children. Erik decided not to kill Strucker, instead joining Xavier to help herald in a golden age for humanity. (What If...Magneto & Professor X Had Formed the X-Men Together? (fb) - BTS) - Soon after, Baron Strucker was arrested as a war criminal and sentenced to death. Charles Xavier and Erik Lehnsherr went on to form a school together to help mutants learn to use their powers. Xavier himself became a well-known peacemaker, helping to end the Cold War and bring peace between Israel and Palestine. He also helped to give Kenya its first mutant President in Ororo Munroe, while Erik Lehnsherr married Gabrielle Haller and wrote a book entitled Understanding Magnetism. (What If...Magneto & Professor X Had Formed the X-Men Together?) - During his periodic visit by Alexei Vazhin, Nick Fury, and Alysande Stuart, Charles Xavier was interrupted by a student of his, Kitty Pryde, who informed him that his new patient had arrived. Xavier and Vazhin then left to greet the new patient, Jean Grey, who was brought to the school by Dr. Hank McCoy. As Xavier introduced Hank to Kitty and Vazhin introduced Xavier to his lieutenant, Peter Rasputin, no one noticed a boy stopping to tie his shoes. The boy secretly placed a bug on the school while Xavier asked Kitty to show Hank and Peter around. Not long after, Dr. McCoy and Professor Xavier attempted to discover the reason behind Jean Grey's coma. The Professor entered her mind and discovered that when Jean was a child, she telepathically experienced the death of her friend Annie Richardson, causing the coma. After the discovery, Xavier opted to get the opinion of Erik Lehnsherr while Kitty continued to show Peter Rasputin and Dr. McCoy around the school. She showed them the school's sub-basements, which housed various laboratories and a machine that was able to tap into any datanet or satellite on the planet. Another of Xavier's associates, Sage, soon joined the trio and discovered that Dr. McCoy was a mutant himself with a secret, blue-furred, form. With Erik Lehnsherr's help, Xavier was soon able to determine that Jean Grey's mind existed on multiple planes of being. As they discussed whether or not they should bring her out of the coma, the school was attacked by a group of robot Sentinels created by Larry Trask. Kitty, Peter, Dr. McCoy, and Sage soon heard the rumbles outside and split up to help. Kitty and Peter phased outside, where Peter revealed his mutant power to transform into a steel form. Sage and Dr. McCoy soon joined the battle as well, after Sage explained to Hank how to use a rail gun. As the battle escalated, two more of Xavier's associates, Mystique and Wolverine, drove a diesel truck onto the school grounds and joined in the fight. The Sentinels soon began to adapt to the attacks, but before they could gain the upper hand, a conscious Jean Grey appeared, surrounded by a fiery bird, and destroyed the Sentinels. 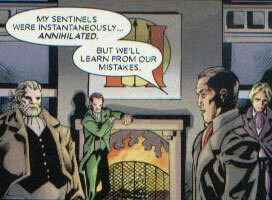 Later that night, as Xavier and his associates discussed how to deal with the recent threat, Larry Trask visited the Manhattan branch of the Hellfire Club and explained how he could not understand how his Sentinels were annihilated. Outside the school, the group was being watched by another group of mutants called the Marauders. The Marauders watched the flaming wreckage of the Sentinels until they were recalled by their master, a man called Sinister. The Marauders Havok and Cyclops spoke with one of their own, Sabretooth, about why they didn't help in the fight with the Sentinels, but Sabretooth just explained that Sinister had told them to kill Xavier's crew, not help them. Professor X eventually decided to deal with the threats by creating a team of heroic mutants, which he dubbed the X-Men. Comments: Created by Chris Claremont, Tom Raney, and Scott Hanna. The Doug mentioned in the story by Kitty Pryde was more than likely Doug Ramsey, although it was never actually said. This reality's divergence point occurred during the events seen in a flashback in Uncanny X-Men#161 (September, 1982). Billy was a trucker who was transporting Sentinels for Larry Trask. His rig was stopped by Mystique and Wolverine and upon discovering they were mutants, Billy and his partner unleashed the Sentinels, who made their way to the school of Charles Xavier. --What If...Magneto & Professor X Had Formed the X-Men Together? 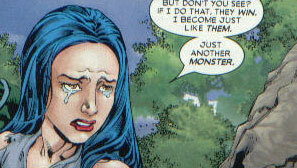 Valerie Cooper was basically the same as her Earth-616 counterpart. She was the Presidential Assistant for National Security Affairs and routinely met with Charles Xavier to discuss mutant affairs. When Alexei Vazhin visited Professor X, Val Cooper and Nick Fury were present in holographic form. Nick Fury was the head of the National Security Council and routinely visited Charles Xavier to discuss mutant affairs. When Alexei Vazhin visited Xavier, Nick and Val Cooper of National Security Affairs were present in holographic form. When Jean Grey was a child, she telepathically experienced the pain of her friend Annie Richardson getting hit by a car. The grief caused her to lapse into a coma of which she had never awoke. Years later, she was brought to Charles Xavier by Dr. Hank McCoy for help. Xavier and Erik Lehnsherr determined that Jean's mind appeared to exist on various planes of existence. Before they could help her, they were attacked by robotic Sentinels. The danger of the situation snapped Jean out of her coma and she appeared in the battle surrounded by a fiery bird, where she destroyed all of the Sentinels in one fell swoop. After the battle, she agreed to join Charles Xavier in dealing with the recent threats as one of his X-Men. Jean Grey had the same telepathy and telekinesis as her Earth-616 counterpart. She was also possessed of the Phoenix Force, which greatly increased her abilities. The Hellfire Club, like its Earth-616 counterpart, was a group of the world's social elite. After Erik revealed his mutant powers to Charles Xavier during a battle where they saved Gabrielle Haller from Baron Strucker, Erik agreed to help Charles usher in a golden age for humanity. He soon married Gabrielle Haller and wrote a book entitled Understanding Magnetism. When Jean Grey was brought to Xavier for help, Erik assisted Charles by using his magnetic abilities to examine her. He discovered that her mind existed on various planes of existence and was concerned that if she awoke from her coma that it would be disastrous. 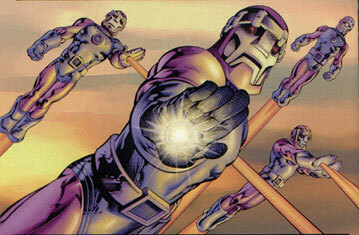 Before he and Xavier could decide what to do, they were attacked by a group of robotic Sentinels created by Larry Trask. Erik quickly joined the battle against the Sentinels and after the battle, decided to help deal with the recent threats by helping Xavier found a group of heroic mutants, which Xavier dubbed the X-Men. 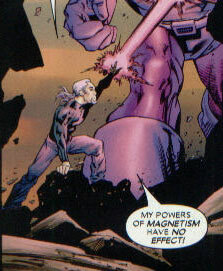 Erik Lehnsherr had the same magnetic abilities of his Earth-616 counterpart, Magneto. Gabrielle Haller was a woman who had been kidnapped by Baron Wolfgang von Strucker and rescued by Charles Xavier and Erik Lehnsherr. After the battle, she stopped Erik from killing the Baron, prompting Erik to help Xavier usher in a new golden age for humanity. Gabrielle went on the marry Erik. Lockheed was the pet dragon of Kitty Pryde. He did not appear much different than his Earth-616 counterpart with the exception that he somehow made his way to Earth prior to the X-Men's formation, where he befriended Kitty. When Kitty joined Xavier's X-Men, Lockheed accompanied her. Lockheed had the same winged flight as his Earth-616 counterpart. He could also presumably breathe fire. 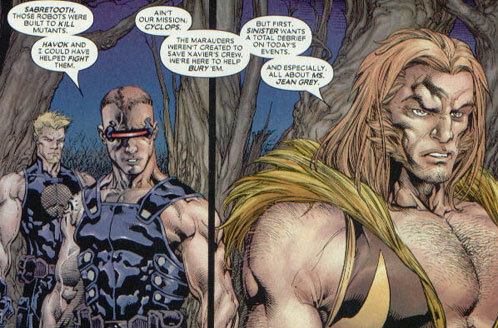 The Marauders were: (left to right): Havok, Cyclops, and Sabretooth. They were a group of mutants who worked for Sinister. When Sinister sent them to find out information about Xavier's new patient, Jean Grey, the Marauders watched as the Sentinels attacked the school. After the battle, Cyclops asked Sabretooth why they didn't help and Sabretooth replied that they were there to kill Xavier and his associates, not to help them. He then told Cyclops that Sinister wanted a total debriefing on Jean Grey. Dr. Hank McCoy was an accomplished doctor who brought Jean Grey to Professor X for treatment. The two worked together and in the down time, Hank was shown around Xavier's school by Kitty Pryde. When Hank met Sage for the first time, she deduced that Hank was secretly a blue-furred mutant. During one of his trips around the school, the school was attacked by Larry Trask's robotic Sentinels. As Kitty and Peter Rasputin rushed into battle, Sage threw Hank a rail gun and explained to him how to use it. 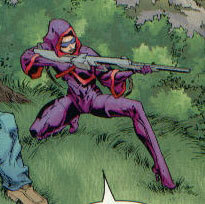 Both he and Sage then exited onto the grounds visited a hidden exit and fired on the Sentinels. When the battle seemed lost, the now-awake Jean Grey appeared and destroyed the Sentinels. Afterwards, Professor X decided to create a team of heroic mutants to deal with threats such as the Sentinels. Hank stayed on to join the team, which Xavier dubbed the X-Men. 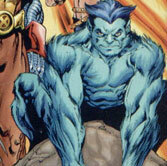 Hank, like his Earth-616 counterpart, had great agility and strength, as well as blue-furred form. Ororo Munroe was a friend of Charles Xavier who eventually became the President of Kenya. Ororo presumably the same weather-manipulating abilities of her Earth-616 counterpart. Mystique was an associate of Charles Xavier who often partnered with another of Xavier's associates, Wolverine. She aided in Wolverine in stopping a diesel truck housing robotic Sentinels. When the truckers discovered that Mystique was a mutant, they shot her, causing her to revert to her true form. The truckers then released the Sentinels, who made their way to Charles Xavier's school. 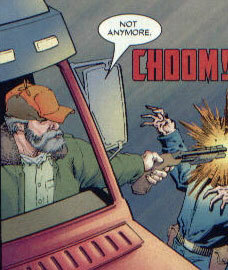 A battle soon broke out at the school, with Mystique and Wolverine arriving soon after in a deserted diesel truck. The battle was ended when Jean Grey appeared and destroyed the Sentinels. Afterwards, Charles Xavier created a team of heroic mutants to combat threats such as the Sentinels. 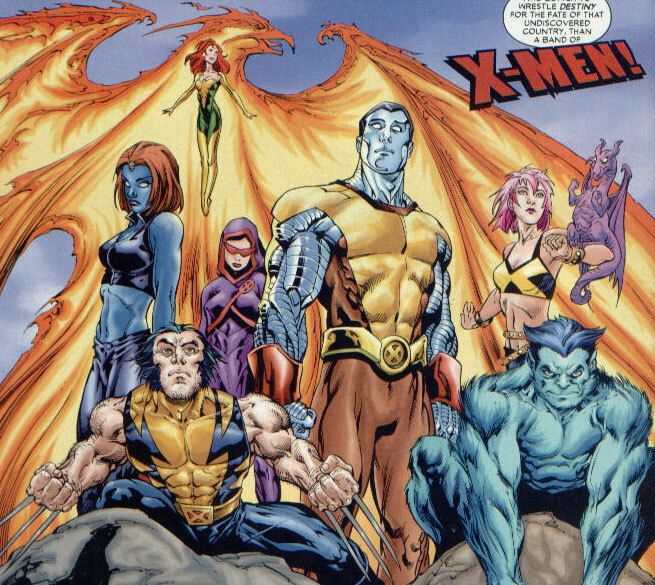 Mystique and the others present during the battle became the first X-Men. When Charles Xavier was young, he saved Gabrielle Haller from the Nazi war criminal Baron Strucker with the help of another mutant, Erik Lehnsherr. After the battle, Erik dedicated himself to helping Charles usher in a golden age for humanity. In the years that followed, Charles became known as a peacemaker, helping to create peace in the Middle East, end the Cold War, and give Kenya its first mutant President in Ororo Munroe. He also established a school intended to house mutants and was routinely visited by members of the world's governments to discuss mutant affairs. During a visit by Alexei Vazhin, Xavier was introduced both to his new patient, Jean Grey, and Vazhin's lieutenant, Peter Rasputin. Soon after, he began trying to help Jean Grey through a years-long coma with the help of his friend Erik Lehnsherr. During the treatment, the school was attacked by mutant-hunting Sentinels and Xavier was injured. The shock of Xavier's injury awoke Jean Grey from her coma and she appeared outside of the school, where she destroyed the Sentinels. After the battle, Xavier decided that something had to be done about the threats on mutant life. He decided to form a group of heroic mutants, which he dubbed the X-Men. Katherine Pryde was a student of Charles Xavier who went to the University of Chicago and had a passion for wearing different colored wigs. After completing a custom computer for Charles Xavier, Kitty left to remind Charles that his new patient, Jean Grey, had arrived. Unfortunately, she did not concentrate upon entering the gym where Xavier and Alexei Vazhin were playing a game of basketball. She phased through the wall, wearing nothing but her wig. Upon realizing her mistake, she quickly left and returned to show Vazhin's lieutenant, Peter Rasputin, around Xavier's school. During a trip around the school with Peter and Dr. Hank McCoy, the school was attacked by Sentinels, prompting Kitty and Peter Rasputin to rush outside and join the battle. After the battle had ended, Charles Xavier formed a group of heroic mutants to combat threats on mutants. Kitty became one of the first mutants to join Charles's newly-named X-Men. Kitty had the same ability to decrease her density, like her Earth-616 counterpart. Peter Rasputin, who was trained by the Black Widow herself, was the secret agent lieutenant of Colonel Alexei Vazhin, who Vazhin had left with Xavier as a liaison. Kitty Pryde showed Peter around the school until it was attacked by a group of robotic Sentinels. Peter soon joined in the battle, revealing his mutant powers to Kitty. After the battle, Peter became one of the first X-Men, a group of mutants dedicated to preventing threats on mutant life. Peter had the mutant ability to convert his body into superhumanly strong steel, like his Earth-616 counterpart, Colossus. Annie Richardson was a childhood friend of Jean Grey who had been killed by an oncoming car. When she died, Jean Grey experienced all of Annie's pain telepathically and fell into a coma. 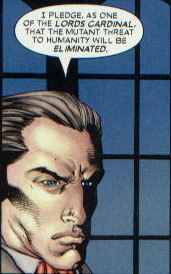 Sage was an associate of Xavier's who discovered that Dr. Hank McCoy was actually a mutant. When Sentinels attacked Xavier's school, Sage explained to Hank how to use a rail gun and the two fired on the Sentinels from afar. 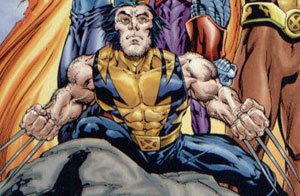 After the battle, Sage became one of the first X-Men, a group of mutants dedicated to preventing threats on mutant life. Sage had the ability to see the potential in others, like her Earth-616 counterpart. The Sentinels were robotic creations of Larry Trask, who had adopted a hatred of mutants from his father, Bolivar Trask. Using his corporate wealth and power, Larry designed the Sentinels and attacked Charles Xavier's school on behalf of the Hellfire Club, where he was one of the Lords Cardinal. When the Sentinels were defeated by Jean Grey, Larry returned to the Hellfire Club, where he swore to eliminate the mutant menace. Each of the Sentinels were equipped with boot jets that allowed flight and energy projectors in their hands. They also possessed immense size and strength. Trask had also designed the Sentinels with the ability to adapt to the various mutant powers that were used against them. Baron Wolfgang von Strucker was a Nazi war criminal who kidnapped Gabrielle Haller in an attempt to find a stash of hidden gold. 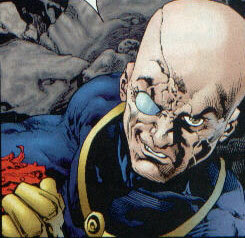 He was defeated by Charles Xavier and Erik Lehnsherr, who was prepared to kill him. Gabrielle managed to talk Erik out of killing Strucker and instead join Xavier in helping mankind. Following his defeat, the Baron was arrested and tried for war crimes, where he was sentenced to death. Baron Strucker wore a cybernetic "Satan Claw" on his right hand that allowed him to discharge electricity and boosted his strength. Larry Trask was the son of Bolivar Trask, who was known for his anti-mutant agendas. Larry controlled one of the world's most powerful corporations and was one of the Lords Cardinal of the Hellfire Club. On behalf of the Hellfire Club, Larry created the robotic Sentinels and sent them to destroy Charles Xavier's school for mutants. With the defeat of the Sentinels, Larry returned to the Hellfire Club, where he vowed to eliminate the mutant menace. Alexei Vazhin was a member of the Federal Security Bureau who routinely visited Charles Xavier to discuss mutant affairs. During one such visit, Vazhin introduced Xavier to his mutant lieutenant, Peter Rasputin, who stayed at the school as Vazhin's liaison. Logan was an associate of Charles Xavier who investigated a group of diesel trucks with Mystique. Upon discovering that they housed Sentinels, Wolverine and Mystique rushed to Xavier's school, arriving in time to help battle the Sentinels. After the battle, Wolverine joined up with Xavier's newly-formed X-Men in order to combat threats to mutantkind. Wolverine had the same superhuman senses, healing factor, and claws of his Earth-616 counterpart.